How Long Do Human Hair Lace Wigs Last? The world of lace wigs can seem daunting with a range of wigs from human hair lace wigs to synthetic hair lace wigs and many versions in between. To help you understand the difference, here at TCPG we’ve created a guide to help make things clear. Lace wigs made with human hair are basically wigs made using French or Swiss lace for the wig cap but instead of using synthetic hair fibres, human hair is used. A human hair lace wig can be either a full lace wig where the entire cap is made of lace, a lace front wig where the front and sides are made of lace but the rest of the cap is wefts. "How Much Do Human Hair Lace Wigs Cost?" One of the biggest differences between a lace wig made with human hair and a synthetic hair lace wig is the cost. Due to the process of buying hair from all over the world (including India, Brazil, Russia and China to name but a few countries), the process also involves cleaning the hair, ensuring that (cuticles) strands remain facing the same direction (so as to prevent tangling), creating the necessary texture to the hair if the original hair drawn was straight, colouring the hair along with the ventilating process means that lace wigs made with human hair are the most expensive type of lace wig. Depending on where you shop, a good quality 12" full lace wig made from human hair is likely to start around the £140 mark; a 12" lace front wig made with human hair will start around the £110 mark. "Can You Use Heat Styling Tools On Lace Wigs With Human Hair?" 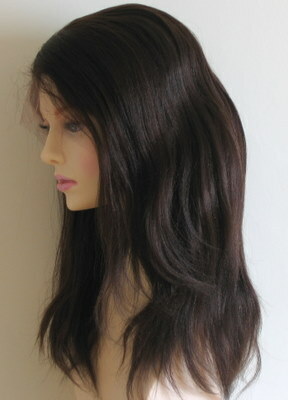 Unlike synthetic hair laces wigs, all lace wigs made with human hair wigs are heat resistant, just like you would expect. However, the overuse of heat styling tools will damage human hair wigs much in the same way it damages human hair attached to heads! A TCPG top tip is to always use the lowest possible heat settings and to use heat styling tools as little as possible.. This will prevent, split ends, the hair looking limp and lifeless and so will prevent your wig from “wearing out” more quickly. "What Hair Colours Are Available In Lace Wigs Made With Human Hair?" You’ll be pleased to know that human hair wigs follow the same colour schemes as synthetic hair lace wigs, with colours from 1 (jet black) to 613 (platinum blonde) and everything you can think of in between. However what we will say is that quite often it can be difficult to obtain a colour like 1b (off black) and the colouring process is not an exact science and sometimes there can subtle differences in the same shade – the process is a lot simpler with artificial (synthetic) hair. The down side with human hair wigs is that certain colours like greens and blues are more difficult to create than with synthetic hair - but this doesn't mean it's impossible. "Are Human Hair Lace Wigs Durable?" Just how long will your lace wig made with human hair last? That depends on how often the wig is worn along with how it’s treated. If you follow the basic guidelines of not overusing heat styling tools and always detangling from tip to root as seen in our wig care guide then you can expect your wig to last anything from a few months to a few years. Obviously the less often the wig is used the longer it will last. We often advise that if you plan to wear your wig every day that it may be better to buy two and swap them periodically. "What Are The Benefits of Human Hair Lace Wigs?" Lace wigs made with human hair will behave like human hair attached to a head. When washed, it will revert to the texture it was when it arrived through your front door. If it’s a straight wig and you curled it, it will be straight after you wash it. If it’s a curly wig and you straightened it, it will be curly after you wash it. A TCPG top tip is that excessive straightening of a curly wig can impact the curls unless the wig is made from the hair that was naturally curly. The best advice is to buy a wig in the texture you will want to wear most. It’s worth investing in a good quality conditioner to help keep your human hair wig looking in top condition. "What Are The Disadvantages of Human Hair Lace Wigs?" The disadvantage of a lace wig made with human hair is that it costs more than a synthetic counterpart. But if what you’re after is a wig that you can teat like real (human) hair then the best thing to do is buy a human hair wig. So there you have it, now you’re in the know about lace wigs made with human hair.